We hope you will join us to worship on Sunday mornings at 10 am or at one of our many events! Grace United is an Affirming Congregation which seeks through worship, study, work, actions and fellowship, to ensure a safe, nurturing environment. We include all people into the life and ministry of the Grace family: persons of any age, colour ethnicity, gender identity and sexual orientation. We celebrate the richness that diversity brings to the church, even as it challenges us. We remember, as we celebrate God's presence in worship that Grace United church gathers on traditional land of the Treaty 6 First Nations. As Treaty people, we seek to live with respect on this land, and live in peace and friendship with our relations. 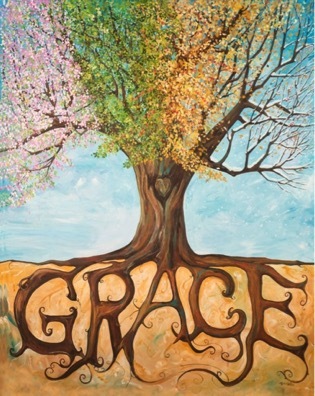 Our Trees: Our congregation often reflects on and finds inspiration in the image of the four-season tree, rooted in Grace, created by local artist Michelle Lake for our church logo. Not only do we find inspiration in the imagery but it reminds us that Grace United Church is full of the kind of people that plant trees. People that are invested in our community and spend time not only planting with the future in mind but also tending and fostering the growth of our community. Our congregation is full of people who regularly step up to help and often lead the charge when it comes to community activities. Many of our members have been recognized as volunteers of the year, citizens of the year, coaches of the year, women of the year… not that they seek these accolades but rather they are just there simply doing the work. that once made, is never regretted. Our Mission Statement: In response to God's call, we the congregation of Grace United Church, understand our mission is to proclaim the gospel to worship and praise and celebrate God's love and, accept God's grace, learn God's will, live in faith, and reach out in humble service in the community and the world. Parking is available in the church lot south of the building, in the Leckie & Associates parking lot or on the streets adjacent to the church. Parking in the Giant Tiger lot is NOT welcome.